The post The Making of "Make ‘Em Laugh"- 35 Years of The Comic Strip appeared first on Jeffrey Gurian. The front cover of "Make 'Em Laugh" with an intro. by Chris Rock, and interviews with Seinfeld, Ray Romano, Billy Crystal, Lisa Lampanelli, Gilbert Gottfried, Susie Essman and tons more! 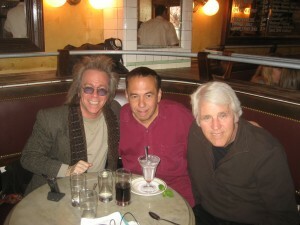 Jeffrey Gurian, Jerry Seinfeld and Richie Tienken at The Comic Strip after Jerry's interview for the book! Richie Tienken, Ray Romano, and Jeffrey Gurian of Comedy Matters TV at The Comic Strip after Ray's interview for the book " Make 'Em Laugh!" Jeffrey Gurian of Comedy Matters TV with Billy Crystal in his offices in Beverly Hills! Billy is pointing to his teeth referencing Jeffrey's former life as a dentist! Richie Tienken, Chris Rock, and Jeffrey Gurian of Comedy Matters TV at The Comic Strip after Chris' interview for the book " Make 'Em Laugh!" Back cover of "Make 'Em Laugh" with blurbs from Judd Apatow, Richard Lewis, Tom Papa. Nick Kroll, Mike Birbiglia, Bob Saget and more!!! Chris Tucker and Jeffrey Gurian up at Sirius Radio with Chris' copy of the book " Make 'Em Laugh"! Jeffrey Gurian with Artie Lange at The Comic Strip with Artie's copy of the book " Make 'Em Laugh!" Jeffrey Gurian of Comedy Matters TV with Richard Belzer at The Friars Club. Jeffrey is holding Richard's book, and Richard is holding his copy of Jeffrey's book "Make 'Em Laugh!" The Comic Strip opened on June 1st of 1976. It’s an iconic comedy club on the Upper East Side of NYC, that launched the careers of stars like Jerry Seinfeld, Eddie Murphy, Chris Rock, Ray Romano, Paul Reiser, George Wallace, Gilbert Gottfried, Jim Gaffigan, Lewis Black, Lisa Lampanelli, and many more. 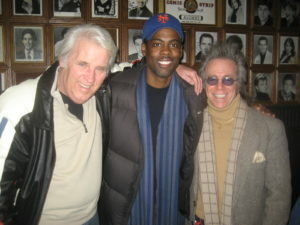 Richie Tienken, Chris Rock, and Jeffrey Gurian at The Comic Strip after Chris' interview for the book "Make 'Em Laugh" for which Chris also write the hilarious intro! One day,on June 16th of 2008 I was at The Strip with Ann Curry, Gilbert Gottfried, and PR powerhouse Ryan McCormick of Goldman/McCormick PR, and after looking at all the talent on the walls, I suggested to owner/founder Richie Tienken that we do a book on the history of the club. He came to my house to talk about it, and saw even more photos than HE had in the club (LOL), and decided to trust me to tell his story. That was the long and the short of it. 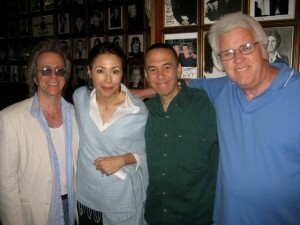 (L-R) Jeffrey Gurian, Ann Curry, Ryan McCormick, Gilbert Gottfried, and Richie Tienken all trying to figure out why Ann looks so surprised! Maybe she heard it would take four years to do the book, and couldn't believe it! The front cover of "Make 'Em Laugh" by Jeffrey Gurian and Richie Tienken with an intro. by Chris Rock! That July, of 2008 I went up to the Just for Laughs Festival in Montreal, which is the biggest comedy festival in the world, and did my first three digital audio interviews. First was with Larry Miller at his hotel, then George Wallace in a restaurant, and then Paul Provenza at the main hotel where the festival was being held. Jeffrey Gurian of Comedy Matters TV with Larry Miller at The Strip! Larry was the very first comic interviewed for the book! Jeffrey Gurian of Comedy Matters TV backstage with George Wallace at the Just for Laughs Festival in Montreal, 2008. George was the 2nd comic to be interviewed for the book! Jeffrey Gurian of Comedy Matters TV with Paul Provenza, at the Just for Laughs Festival in Montreal, 2008. Paul was the the 3rd comic to be interviewed for the book! From that point on, it took the next four years to see this book on a shelf in Barnes and Noble. I was on a quest to get every big star I could, who had come out of The Strip, to be interviewed for the book. And most of them came into the club to do it during the afternoon when we wouldn’t be disturbed. Richie and I would meet them there and sit casually in the showroom while we reminisced about the old days, into my recorder. 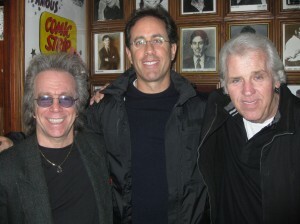 Jeffrey Gurian and Richie Tienken at The Comic Strip with Jerry Seinfeld after his interview for the book "Make 'Em Laugh"! We felt it was helpful to do it in the club, because we thought, and rightly so, that being in the club would help bring back memories, and it did. During Paul Reiser’s interview, he claims to have suddenly remembered for the first time ever, what started the annual New Year’s day brunch that he has attended every year for the last 30 years or more with Jerry Seinfeld, Larry Miller, and Mark Schiff. There was originally a fifth guy named Michael Cain, but unfortunately he passed away many years ago, way before his time. (L-R) Richie Tienken, Ray Romano, and Jeffrey Gurian at The Comic Strip after Ray's interview for the book, " Make 'Em Laugh"! So the book has cool stories from Jerry Seinfeld, Ray Romano, who came in with his long-time manager Rory Rosegarten who he had met at The Strip, Jim Gaffigan, Susie Essman, Lisa Lampanelli, Gilbert Gottfried, Paul Provenza, Lewis Black, Judah Friedlander, Jeffrey Ross, Tony Rock, Adam Ferrara, and so many more! I even flew out to LA to interview Billy Crystal which was a very special one to me, since during the middle of the interview he realized he knew me from the legendary Jack Rollins, who managed him, Robin Williams, and Woody Allen, back in the day! I wanted to do all the interviews before looking for an agent and a book deal, because I knew that agents would be skeptical of someone saying they could get this many interviews, with such big stars, and I wanted to be able to walk in with them already done. After three painstaking years of doing interviews, and transcribing them by hand, my pal media powerhouse Judith Regan, introduced me to her agent at N.S. Bienstock, because she said for a celeb-filled book like this I need a powerful agent, and I spent most of the fourth year editing it down to the length that Skyhorse Publishing wanted it to be. 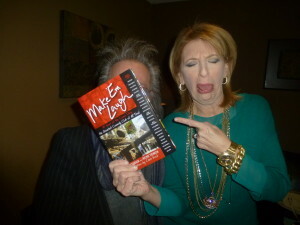 Media heavyweight Judith Regan and Jeffrey Gurian holding the book that she made possible, "Make 'Em Laugh"! I started with about 500 pages, and had to whittle it down to about 250 pages. I have all the stories digitally recorded on a disk, so our next project will probably be a CD of the stories that didn’t make it into the book! Then I had to get blurbs for the book’s back cover, so I went to some of my famous friends and contacts and asked them to read the galleys and to provide meaningful blurbs and I got amazing stuff from ten people; Barry Katz, co-creator of Last Comic Standing, Judd Apatow, the king of Hollywood comedies, Richard Lewis, Mike Birbiglia, Charles Grodin, Elayne Boosler the first woman ever to have a cable TV special, Danny Aiello, Michael Imperioli, Nick Kroll star of the upcoming The Kroll Show, on Comedy Central, Tom Papa, and even DJ Cassidy, the world famous DJ who is also the DJ for Russell Simmons’ show “The Ruckus” hosted by JB Smoove! The back cover of "Make 'Em Laugh" with blurbs from Barry Katz, Richard Lewis, Mike Birbiglia, Charles Grodin, Elayne Boosler, Danny Aiello, Michael Imperioli, Nick Kroll, Tom Papa, Bob Saget, and DJ Cassidy! Jeffrey Gurian of Comedy Matters TV with Chelsea Handler at Just for Laughs in Montreal! Jeffrey Gurian of Comedy Matters TV with Bob Saget backstage at Bob's gala at the Just for Laughs Festival in Montreal! So as of Monday, 10/1/12 the book is in Barnes and Noble and is available on their site and on Amazon.com All the stars in the book are helping to get the word out and even stars not in the book like Dave Chappelle are posing with the book! Jeffrey Gurian of Comedy Matters TV with Colin Quinn holding "Make 'Em Laugh", which Colin is in! Jeffrey Gurian of Comedy Matters TV with Judah Friedlander holding a copy of "Make 'Em Laugh" which he is in! Dave Chappelle chillin' at the bar at The Comic Strip reading "Make 'Em Laugh" about the 35 year history of the club! Rick Newman Has The Comedy Midas Touch! Rick and I go back a long way, as we were reminiscing on the phone the other day, and he was kind enough to give me a very special scoop which I will share with you Comedy Matters guys! 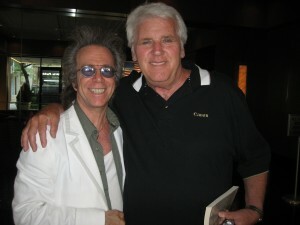 Rick Newman and Jeffrey Gurian of Comedy Matters TV at the Friars Roast of Pat Cooper in 2007! A photo of the new, completely refurbished Triad Theatre, NY home of Celebrity Autobiography, on West 72nd Street. set to re-launch this coming November! This is the former space where once a month, on Monday evenings, for the last four years, Rick has been offering his international hit “Celebrity Autobiography”, where celebs come in and read other celebs autobiographies, and audiences go crazy for it. Some of the New York regulars who appear are Susie Essman, Joy Behar, Matthew Broderick, John Leguizamo, Martin Short, Brooke Shields, Mario Cantone, Sherri Shepherd, Alan Zweibel, Rachel Dratch, and Kristen Wiig! It’s like a Who’s Who of showbiz! And I hear there’s actually a waiting list of celebs who would like to appear. This new expensively overhauled theatre is set to be re-launched this coming November, right in time to run a week of shows during Caroline Hirsch’s New York Comedy Festival. As a matter of fact, the entire month of November will feature new “avant garde” productions in comedy, music, one person shows, plays, and seminars, and right now I’m thinking about what I could present in that one-of-a-kind space! According to Rick, “there’s no other place quite like it”, and he should know! They even installed a complete state-of-art projection unit for screenings plus a luxury green-room. Rick has always stayed current with trends so part of the transformation of the theater “is to make it flexible and be able to use as a studio for the Internet”, he said. And it will be nice not to have to run all the way downtown for this experience, as many art houses are down in Tribeca. This is great because it’s on the Upper West Side! I can’t wait to take him up on his offer to give me a private tour! As a Broadway producer Orin is involved with the new hit “Once” which opened to rave reviews on Sunday, March 18, 2012. A national tour will begin in the summer of 2013, and the cast recently appeared on The View. ONCE has been nominated for 11 Tony Awards, including Best Musical. It was recently named Best Musical by the New York Drama Critics Circle, the Outer Critic Circle and the Lucille Lortel Awards. In addition, the production has been nominated for three Drama League Awards and five Drama Desk Awards. And the story of how Rick came to be involved with Celebrity Autobiography is also a great story. Four years ago, our mutual friend Susie Essman, star of HBO’s hit “Curb Your Enthusiasm”, called Rick all excited and told him he needed to come and see her in this show Celebrity Autobiography. He went, and was hooked from the first night. Rick Newman, Susie Essman, and Richie Tienken the day we did Rick and Susie's interviews at The Comic Strip for the new book on the 35 year history of The Strip called "Make 'Em Laugh"! The four producers at the time, Peter Martin, Angelo Fraboni, Eugene Pack, and Dayle Reyfel, were seeking a fifth producer, and Rick became that producer, but with his own billing. It’s Peter Martin, Angelo Fraboni, Eugene Pack, and Dayle Reyfel in association with Rick Newman! That’s very cool! The final part of this exclusive Rick Newman scoop is that on top of everything else, he is the Exec. Producer of a new online series for Comedy Central called “Thirty Seconds Over Washington” and it’s an updated version of a show he did 16 years ago for HBO, with Dennis Miller and Bill Maher. It consists of political commercials with comics doing analyses and comedic commentary before and after the commercial. I love stuff like that because it’s so fun and so easy to poke fun at these pompous buffoons who take themselves so seriously, while making decisions that affect the course of all of our lives. This is a show I can’t wait to see. I’m not particularly political, but you don’t have to be Mort Sahl in order to see the humor in this type of stuff. Rick appears in my new book with Chris Rock called “Make ‘Em Laugh- 35 Years of The Comic Strip, The Greatest Comedy Club Of All Time”, a book I wrote with Richie Tienken the owner and founder of The Comic Strip. What is especially nice about having Rick in the book is that at the end of 1972, Rick opened up the second big comedy club in New York City called “Catch A Rising Star”. The Strip opened in 1976. Before that it was just Budd Friedman’s “Improv” which opened in 1963. Catch had regulars like Larry David, Robert Klein, David Brenner, and Billy Crystal. Richie Tienken was present when I did Rick’s interview at The Strip and Richie had the opportunity to tell Rick that he was his idol and the inspiration for The Comic Strip. That was a very special moment in comedy history and I felt privileged to be present for that, … with these two lions of comedy! Rick Newman and Richie Tienken, the two "lions" of comedy at The Comic Strip, for the book I wrote with Richie called "Make 'Em Laugh." When I launched Comedy Matters back in 1999, Rick was one of the first, if not THE first one-on-one interview I did, because I never wanted to just focus on the talent. I wanted Comedy Matters to also be about the people who made things happen in the comedy world, and Rick has always been one of those people. Rick Newman being interviewed by Jeffrey Gurian for Jeffrey's new column at the time called "Comedy Matters", circa 1999. We both had darker hair and matching moustaches! On top of everything else he does, Rick runs the Activities and Entertainment Committee at The Friars Club with Prior Stewie Stone, and plans special events for the club. 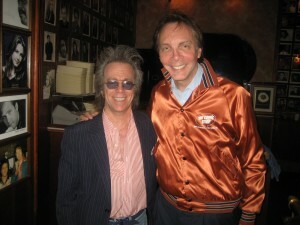 Rick Newman and Jeffrey Gurian of Comedy Matters TV at The Friars Club back in 2006! We wish Rick lots of luck in all of his many endeavors! Posted in "Alan Zweibel", "Barbara Walters", "Broadway Shows", "Brooke Shields", "Celebrity Autobiography", "Comedy Matters TV", "Joy Behar", "Make 'Em Laugh", "Mario Cantone", "Martin Short", "Orin Wolf", "Peter Martin", "Rachel Dratch", "Rick Newman", "Sherri Shepherd", "The View", "Triad Theatre", Blog, Broadway, Celeb Photos, Comedians In The News, Comedy Clubs, Comedy Events, Comedy Matters, Curb Your Enthusiasm, Featured, General Information, HBO, Jeffrey Gurian, John Leguizamo, Kristen Wiig, Matthew Broderick, Nightlife Events, Once, Red Carpet Events, Richie Tienken, Sketch Comedy, Susie Essman, The Comic Strip, Variety Show | Comments Off on Rick Newman Has The Comedy Midas Touch!